Grantsville is the second most populous city in Tooele County, Utah, United States. It is part of the Salt Lake City, Utah Metropolitan Statistical Area. The population was 9,063 on the 2011 report  of the American Community Survey, a branch of the U.S. Census Bureau. The city has grown slowly and steadily throughout most of its existence, but rapid increases in growth occurred during the 1970s and 1990s. Recent rapid growth has been attributed to the nearby Deseret Peak recreational center, the Miller Motorsports Park raceway and to the newly built Wal-Mart Distribution Center located just outside the city. It is quickly becoming a bedroom community for commuters into the Salt Lake valley. Grantsville is bordered on the south by South Mountain, which separates Rush Valley from Tooele Valley. To the north is Stansbury Island, and on the east are the Oquirrh Mountains and the Great Salt Lake and on the west side the Stansbury Mountains. SR-138 passes through the city, heading northwest to intersect with I-80 and east to Stansbury Park. The climate is hot during the summer and cold and snowy during the winter. Although Grantsville can be affected by lake-effect snow off of the Great Salt Lake, most of the time it is too far southwest. According to the United States Census Bureau, the city has a total area of 19.34 square miles (46.2 km²), of which, 19.2 square miles (46.1 km²) of it is land and 0.04 square miles (0.1 km²) of it (0.22%) is water. As of the census  of 2011, there were 9,063 people, and 2,916 households in the city. The population density was 459.8 people per square mile (180.9/km²). The racial makeup of the city was 95.7% White, 0.1% African American, 0.7% Native American, 0.1% Asian, 0.2% Pacific Islander, and 2% from two or more races. Hispanic or Latino of any race were 5.1% of the population. Recorded in the 2000 census:  There were 1,856 households out of which 49.4% had children under the age of 18 living with them, 68.4% were married couples living together, 9.2% had a female householder with no husband present, and 17.7% were non-families. 15.4% of all households were made up of individuals and 7.8% had someone living alone who was 65 years of age or older. The average household size was 3.24 and the average family size was 3.62. In the city, the population was spread out with 36.7% under the age of 18, 10.1% from 18 to 24, 27.3% from 25 to 44, 17.4% from 45 to 64, and 8.5% who were 65 years of age or older. The median age was 27 years. For every 100 females, there were 100.8 males. For every 100 females age 18 and over, there were 96.4 males. The median income for a household in the city was $45,614, and the median income for a family was $50,433. Males had a median income of $38,715 versus $24,548 for females. The per capita income for the city was $15,681. About 4.3% of families and 5.4% of the population were below the poverty line, including 4.6% of those under age 18 and 7.3% of those age 65 or over. 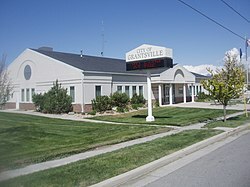 Grantsville is in the Tooele County School District and has two elementary schools (Grantsville and Willow), Grantsville Junior High School, and Grantsville High School. There are also a few preschools. Due to a fire on July 13, 2009, Grantsville Elementary School was forced to close until a new elementary school was built. The new school opened for the 2011-2012 school year. Joshua Reuben Clark, Jr., former U.S. ambassador to Mexico. ^ a b "U.S. Census Bureau 2011 Report". ^ Dennis R. Defa. "Goshute Indians". Utah History Encyclopedia. ^ a b The Utah Genealogical and Historical Magazine, Volumes 9-10. 1918. p. 184. ^ "Post Offices". Retrieved 22 January 2018. ^ "Census of Population and Housing". U.S. Census Bureau. Archived from the original on February 8, 2006. Retrieved November 18, 2011. ^ Gillie, Tim (July 21, 2009). "After-fire plan set for Grantsville Elementary School students". Tooele Transcript Bulletin. Utah. Retrieved September 16, 2009. ^ "Town Tradition Bridges Old and New," Deseret News, March 17, 2009. ^ "Glimpses of Grantsville," Tooele Transcript Bulletin (Utah), March 27, 2008. 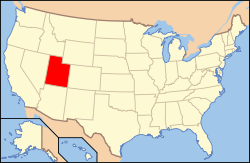 Wikimedia Commons has media related to Grantsville, Utah.